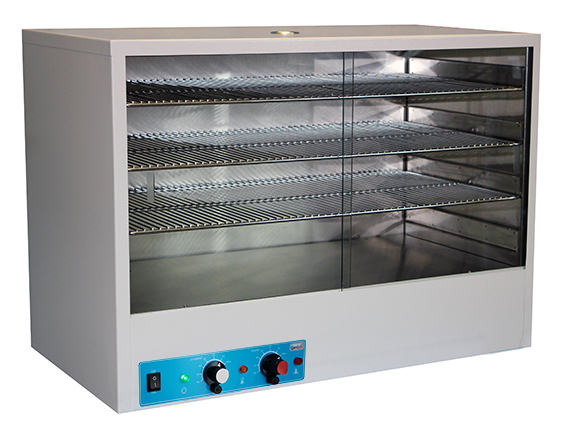 The Genlab range of Drying / Warming Cabinets are suitable for drying a range of items such as glassware, instruments and PCB's. They are also used to aid any general purpose warming applications. Genlab has sold these Drying Cabinets extensively across the globe and they have always proved to be a very popular product. Two variants are available which as the standard non-insulated units and insulated units for improved efficiency plus energy and cost savings. A touch screen digital controller is also available as an optional upgrade on the insulated versions. The exterior is constructed from sheet steel finished in an easy clean powder coated paint. It is fitted with adjustable shelf runners, removable plated wire grid shelves and ventilation outlets. The insulated range of units give far greater temperature control, allowing greater accuracy during the drying and warming process. The resulting reduction in energy requirements gives a performance saving of over 30% compared to the non-insulated range. Models under 250 litres have sliding, toughened glass doors. the larger models have hinged, toughened glass doors. Heated by Incoloy sheathed elements which are positioned in the base of the unit. Units above 425 litres have a fan assistance as standard. Available with two options, thermostatic or touch screen digital interface. thermostatic control comprises of a direct reading thermostat with calibrated scales and tamper proof locks and an indpendant overheat thermostat as standard. They also include a mains switch and heating lamp indicator. The upgraded touch screen option offers both accurate temperature control and integral overheat system by using 2 individual Pt100 sensors. Oven trending is displayed for up to 48 hours and cabinet status is shown on the 3.2 in colour screen. All units have a powder coated mild steel exterior and the insulated cabinets have 304 Stainless steel interior. Genlab is proud to offer their customers a unique range of sustainable laboratory products and services. E3 is our market leading brand for scientifically developed, cutting edge, sustainable, eco-friendly products. 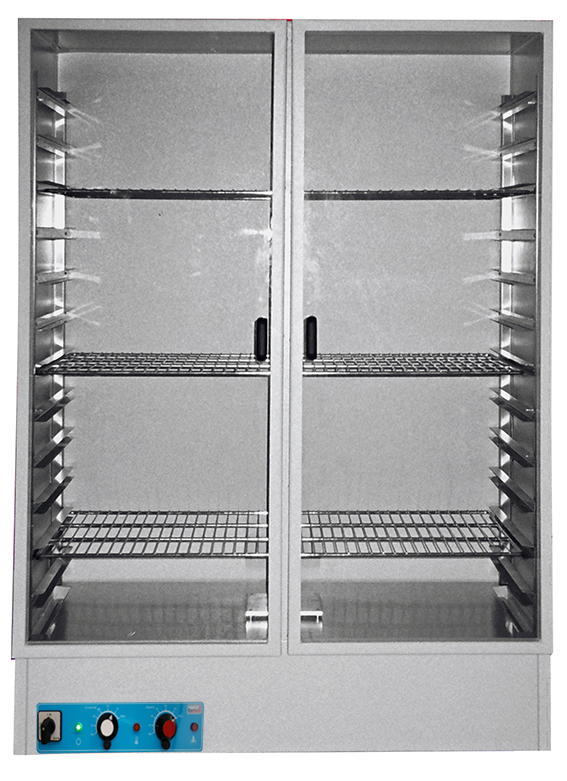 Genlab's new E3 range of glassware drying cabinets are energy efficient, safer and economic to run. Working with the University of Cambridge, we developed units that represent a novel, sustainable solution to glassware drying. The feature our latest touch screen control system, which offer intuitive control and excellent accuracies with bespoke firmware for energy saving control, including adjustable automatic on/off times. The exterior is constructed from sheet steel finished in an easy clean powder coated paint. The interior chamber is made from 304 stainless steel and all units have high density insulation. The 100 and 200 litre models have sliding glass doors and the 425 and 885 litre models have double glazed hinged doors. Heated by Incoloy sheathed elements which are positioned in the lower chamber and covered with 304 stainless steel guard. The control system comprises of a bespoke touch screen interface that offers both accurate temperature control and integral overheat system by using 2 individual Pt100 sensors. The cabinets automatically turn on and off (up to two times per day) with boost and extended functions available outside of the set times. Oven trending is displayed for up to 48 hours. All units have a 304 Stainless steel interior with a touch screen interface as standard. *All units tested were a set temperature of 75ºC with an empty chamber and the ambient temperature was 22ºC. Energy consumption will differ based on a set temperature and ambient conditions. Fan units are able to remove approximately double the moisture of a convection unit, the time taken to dry a load is therefore halved. As a result the energy used to dry a load is actually lower for a fan unit compared to a natural convection unit. 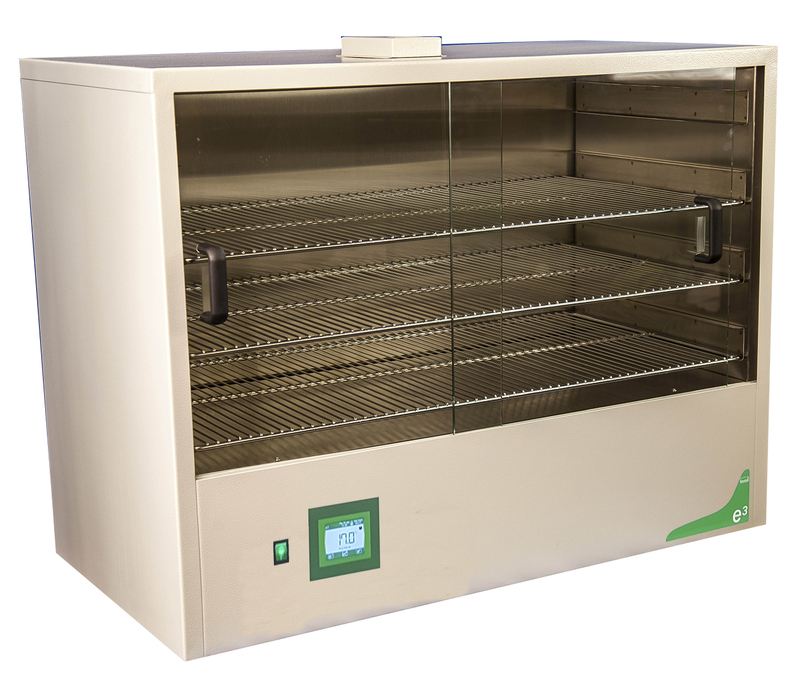 The GENLAB Drying / Warming Cabinets are suitable for drying a range of items such as glassware and instruments and also any general purpose warming applications. Forget traditional energy inefficient, costly to run drying cabinets. 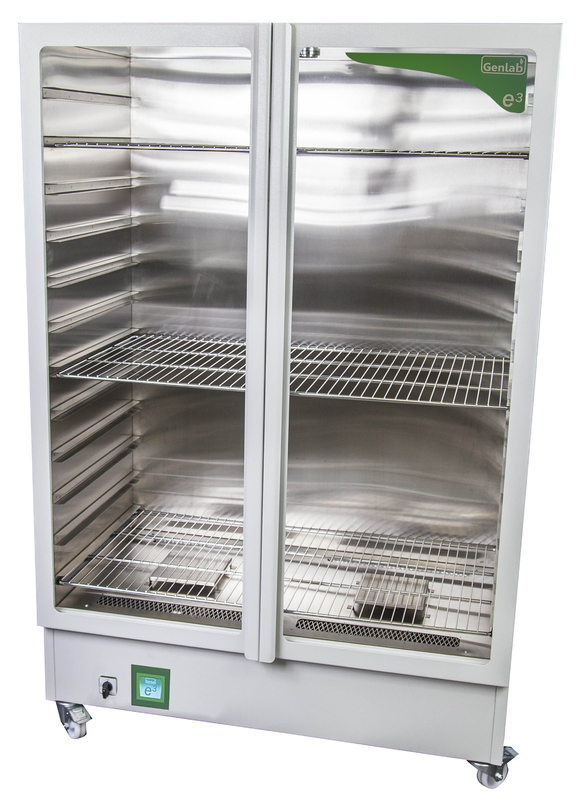 Genlab’s new E3 range of glassware drying cabinets are unique - first to market, energy efficient, safer and cheaper to run. Genlab manufacture a comprehensive range of Drying Cabinets and these units are in use in laboratories, schools and universities worldwide. Typically these particular products are used for drying items such as glassware and instruments. But they can also be used for any general purpose warming application. All Genlab Drying Cabinets are hand built in the United Kingdom at our factory in Widnes, and come with Genlab's two year warranty. The internal chamber is made from stainless steel and the external body is made from either powder coated mild steel or stainless steel. As an additional option, Genlab are also able to supply a stand which keeps the unit at a usable height, but the inbuilt castors allow portability and movement around a laboratory.